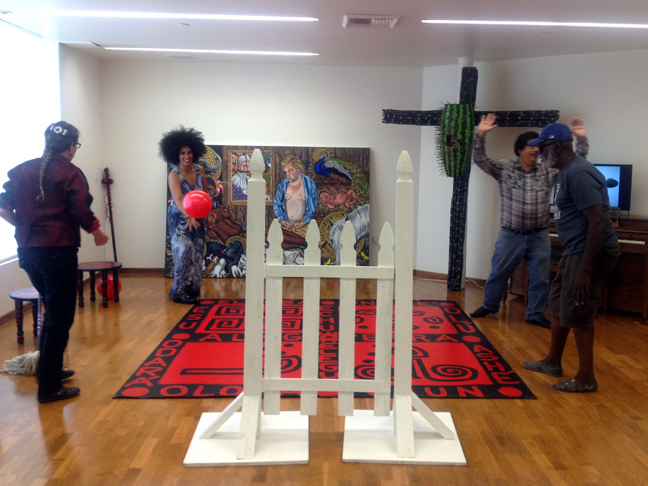 Playing Four Square in the Orishas Through the Crossroads and the Gate Installation of my MFA Thesis Exhibition, Leimert Park Vision Theatre, May 7, 2014, Los Angeles, CA. Pictured left to right: Beth Peterson, Lili Bernard, José P. Rodriguez, Ben Caldwell. 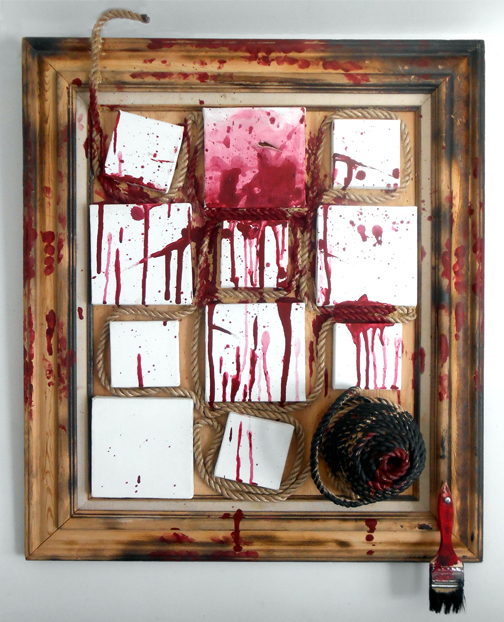 On exhibit was artwork that I created while in graduate school at Otis, as well as three of my Antebellum Appropriation paintings (one of which I finished while in graduate school, the other two the year before I started graduate school). In the work, Ain’t Funny, inspired by Frantz Fanon’s book, Black Skin, White Masks, I incorporate sculpture, video-art and photography to symbolically combat Eurocentricity and the derogatory stereotyping of Black people. 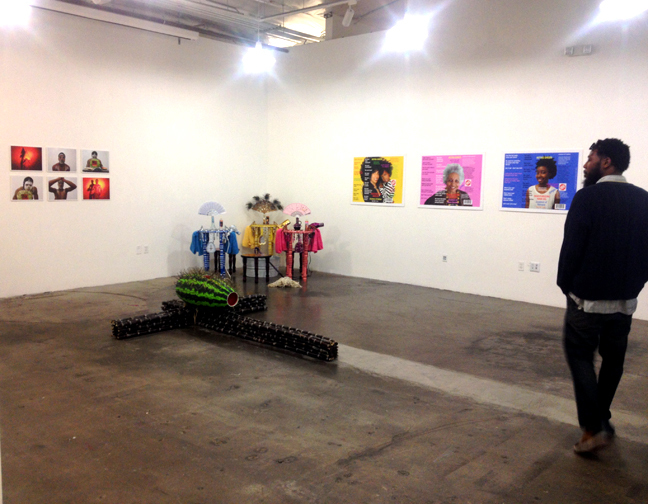 The work explores Black identity, both male and female, through a maternal relationship. 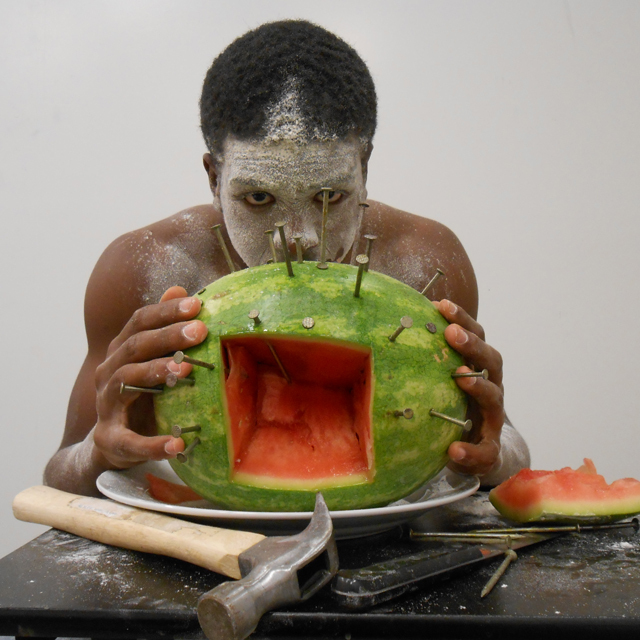 Inspired by Frantz Fanon’s book Black Skin, White Masks, Ain’t Funny is an examination of Black consciousness as seen through a concerned mother’s eyes and her son’s burgeoning manhood. 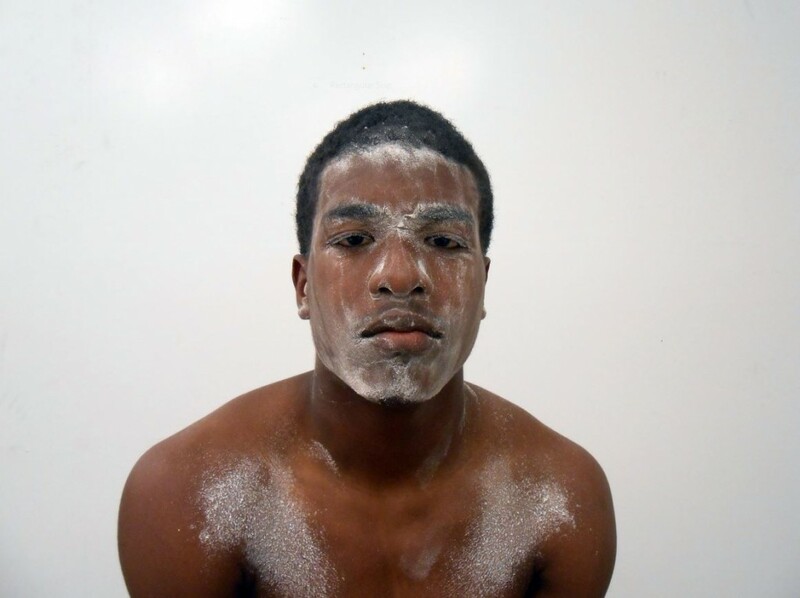 The youth (my eldest son Rafael) who is the subject of the video art piece — as well as of the related Nkisi crucifix sculpture and the photography — asserts his Black masculinity while struggling with society’s attempt to label, dilute and destroy it. He navigates through the layers of his identity, combating racism and stereotypes — with his strength, diligence, resilience, joy, frustration, anger, compassion and vulnerability exposed. 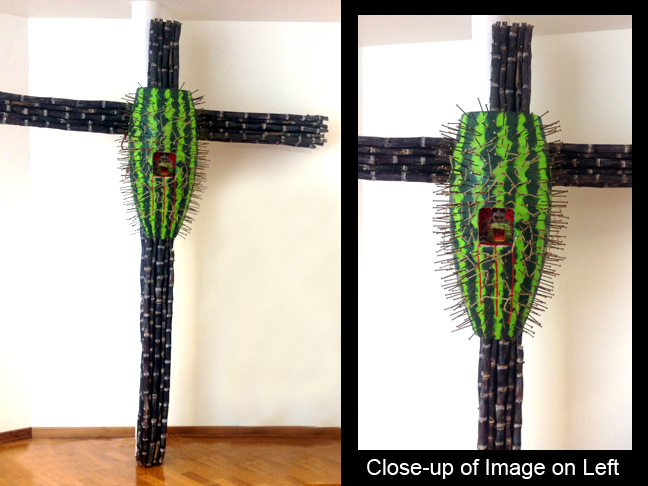 The trope of the video-art, crucifix and photography is the syncretism (resulting from colonialism) of the African religion known as Palo in Cuba (referenced by the Congolese Nkisi-like nail fetish watermelon and whitened face) and Catholicism (referenced by the Passion of Christ and the tabernacle). 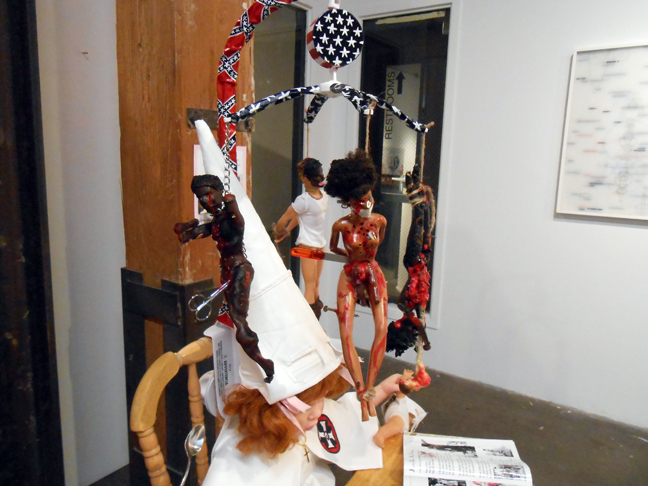 As stated in the beginning of the video, the work is dedicated to two women who were lynched along with their children: Mary Turner (1918 Georgia) who’s 8 month old fetus was gouged out of her belly and stomped to death by the mob as she hung upside down burnt and shot, and Laura Nelson (1919 Oklahoma) who was “swung” from a bridge alongside her 14 year old son L.D. Nelson, made famous by widely distributed souvenir postcards of their lynching. 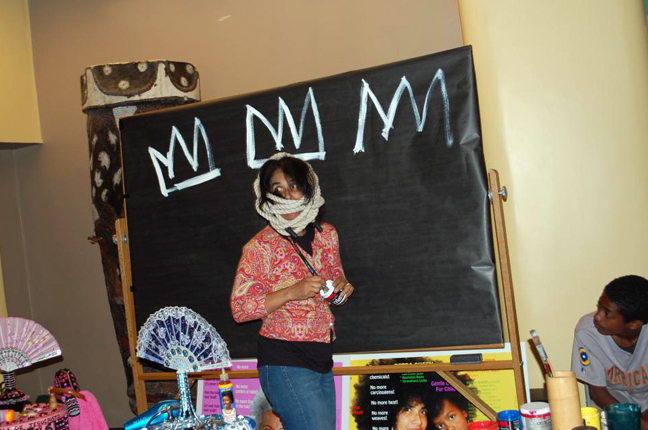 Donning and Dismissal of the Conqueror’s Coiffure is an installation and public engagement ritualistic performance which explores the psyche and self-perception of the colonized Black woman. It raises awareness of the pervasive subconscious association of Blackness with wrongness, as evidenced in commonplace expressions such as “good hair” versus “bad hair.” The examination of these learned subconscious feelings of inadequacy, reflected in hairstyle, speaks to a larger audience. It creates conversation about the collective unconscious dependency born out of colonialism. 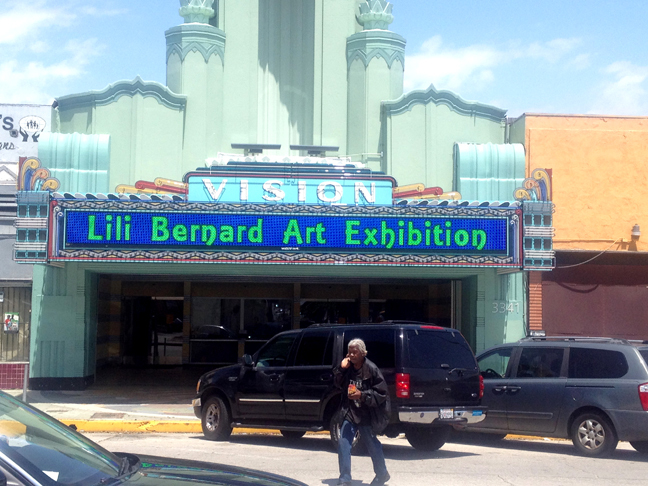 My MFA Thesis Solo Exhibition occurred at the Leimert Park Vision Theatre from Sunday, April 27 – Tuesday May 6, 2014. The opening reception began with spoken word performances by Roger Guenveur Smith, Tonya Ingram, Lena Cole Dennis, Yrneh Gabon. Following was a performance art piece by myself, entitled Brank, then an ensemble performance of Donning & Dismissal of the Conqueror’s Coiffure, which preceded a BAILA (Black Allies in Los Angeles) roundtable discussion on the MicroAgressions of Racism in Academia. and ran through May 7, 2014. The performance incorporates audience participation and live Afro-Cuban Dancers, Singers and Drummers (Kati Hernandez, Craig Ramos & Co). It can also be performed without the dancers and musicians and with audio recordings instead, to avoid the cost of hiring them — though live performers are ideal. BAILA (Black Academics in Los Angeles) Roundtable Discussion on the Micro Aggressions of Racism in Academia with Panelists Holly Tempo (visual artist-professor), Derrick Maddox (visual artist, MFA CalArts), Chelle Barbour (Curator, MA USC), Lili Bernard, Dr. Carole Jordan-Harris (Ob-Gyn-Surgeon-Board of Directors Drew University Medical School), Dr. Roberto Vargas (Physician-Professor, UCLA Medical School), Ronald Robertson (law student UCLA) and Brittany Gibson, Esq (UCLA Law School Grad. 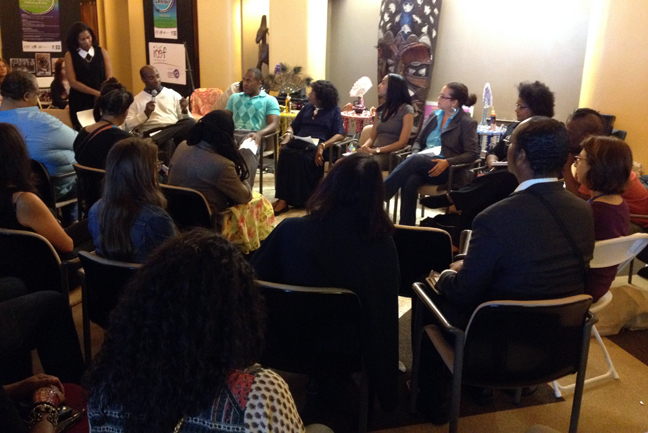 Moderated by Zeal Harris (visual artist). Guests included Dorit Cypis, Renee Petropoulos, John Tai, Karen Moss, Teka-Lark Flemming, Maria Gil, J Michael Walker, Alitash Kebede, Lena Cole Dennis, Katie Loughmiller, Alle, Jose Rodriguez, Lester Grant, Maria Gil, Raksha Parekh, Ruben Hornillo, Fernando Perez, and Carol Zou among dozens of others. 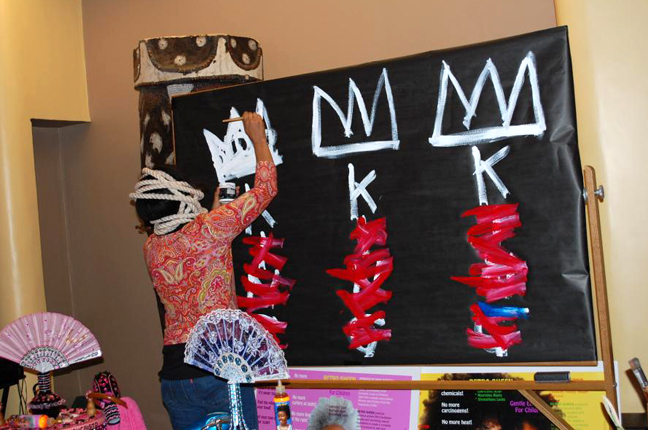 Presented first at California African American Museum, in Los Angeles, on June 15, 2013, Orishas Through the Crossroads and the Gate is an installation, public engagement performance game and art workshop. It metaphorically explores the impact of colonialism as it pertains to privilege, access, boundaries and transcendence. 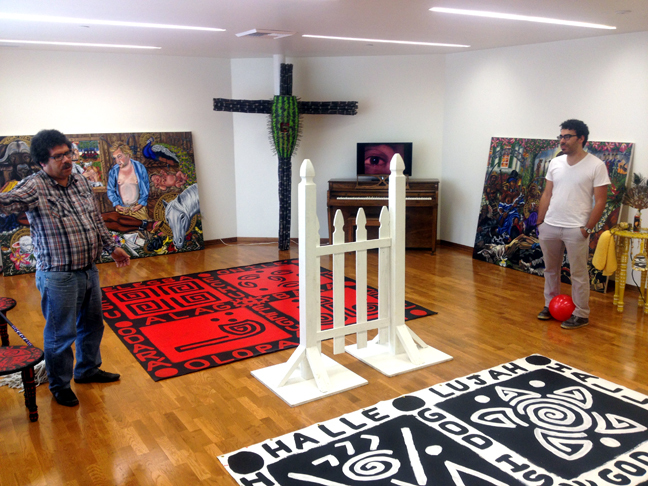 The installation , Orishas Through the Crossroads and the Gate, is a space where, through physical play, participants momentarily escape from the pressures of daily life, while their subconscious delights in memory and imagination. 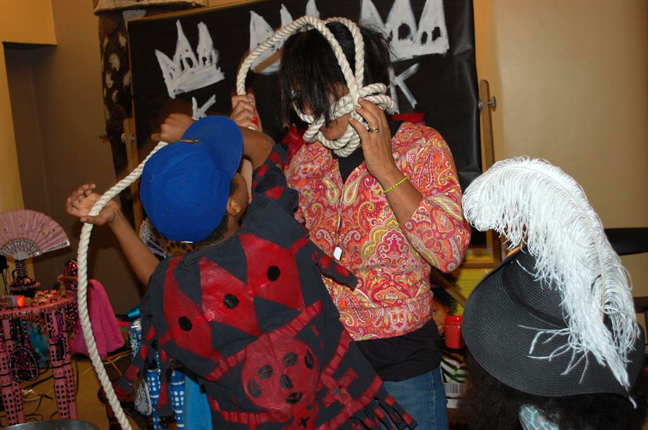 For some, the performance game and art workshop elicit intercession from the spirits of the ancestors. 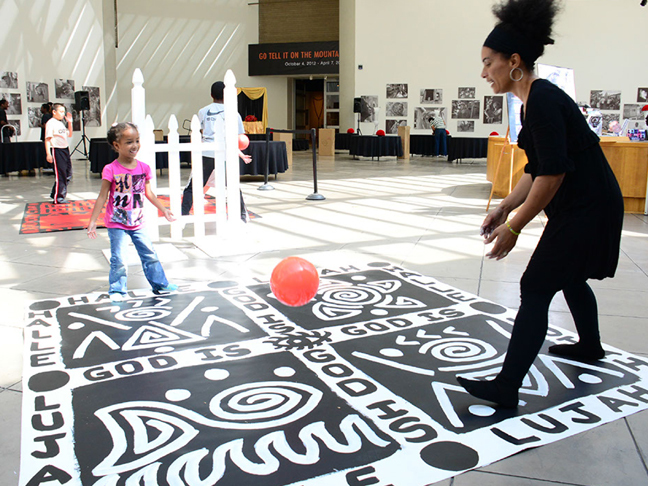 The performance incorporates the popular childhood game of Four Square, stylized in a theme of Afro-Caribbean folklore and religion. It specifically references the syncretism of the Orisha (African deity) Elegua who is seen as a child, and his European (Spanish) counterpart El Santo Niño de Atocha (the Christ Child). The metaphor stems from the biblical passage which states that if we are to enter the Kingdom of Heaven, we must be like children. (Matthew 18:3). Participants learn the following history via educational dialogue during the art-making, and from informational take-home postcards I create: El Santo Niño appeared in the town of Atocha, in 13th Century Spain, when the country was under Muslim rule. Christians were persecuted and imprisoned. An edict stated that prisoners could only receive food if brought to them by a male under the age of 12. At a statue of the Virgin of Atocha with her Christ Child; townswomen prayed for God’s intercession, so that the childless inmates would not starve to death. People reported that a boy, dressed as a pilgrim, began appearing, bringing food and water to the inmates. Each night, after a sighting was reported, the shoes of the Christ Child on the statue appeared dirty and tattered. The women interpreted this as a sign that it was the Christ Child who was feeding the prisoners. Performance-workshop participants also learn that Elegua, the Orisha with whom the Christ Child is syncretized as a result of Criolization, is considered in Yoruba to be the keeper of the crossroads and the gate, of the coming and the going, of opportunities. Also appearing as a boy, he is the spirit who tests you, and asks, “Which path will you take to where you want to go?” His favorite number is 3. It was therefore that the enslaved chose the name of the Christ Child behind which to disguise Elegua, in order to avoid persecution when practicing their religion. Eventually, Elegua became one with the Christ Child, as did other Orishas with the Catholic Saints behind whose names they hid. A new religion was formed, known as Santeria in Spanish and Candomble in Portuguese. During the dialogue, I tell the folklore which explains why Elegua is represented by the colors black and red or black and white. Two brothers in Africa were fighting over a dispute. One brother proclaimed, “I just now saw Elegua and he was wearing a black hat!” The other brother retorted, “No you didn’t! I saw Elegua, just now, and he was wearing a red hat!” (The story was also passed down, substituting the color red for white.) In the midst of the brother’s almost bloody battle, Elegua appears, wearing a hat that is black on one side and red on the other. He says to the quarreling brothers, “You both saw me.” The folklore metaphorically serves as a reminder that there are many different perspectives from which to look at the same thing, and that all viewpoints are valid. This is part of the concept explored in Orishas Through the Crossroads and the Gate. The installation is composed as follows. 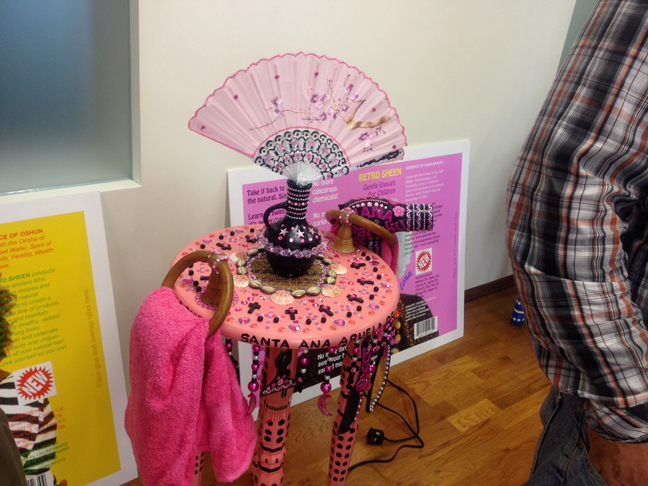 There are tables arranged in a square, for the art workshop. Nearby are two Four Square mats (96″x96″ each) on the ground in tandem, approximately eight feet apart. 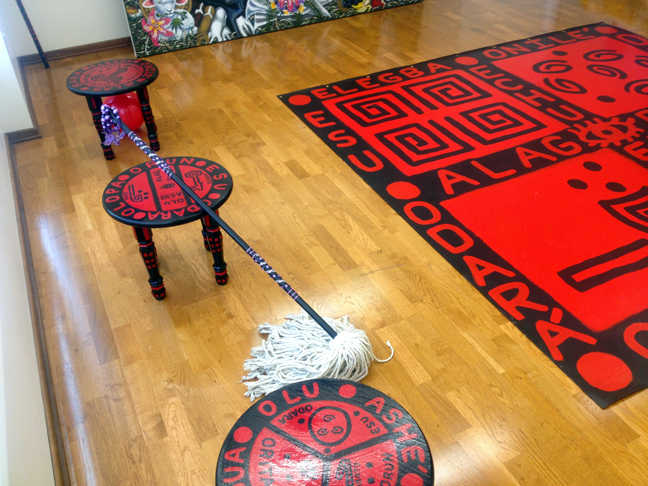 One square, representing Africa, has been hand-painted in black and red, with praise words in Lucumí (Yoruba) and symbolism for the Orisha Elegua. It has a red bouncing-ball on top of it. The other square, representing Europe, has been hand-painted in black and white, with praise words in English and symbolism for the Christ Child. It has a white bouncing-ball on top of it. In the center of the gap, between the two Four Square mats, stands a white picket gate. 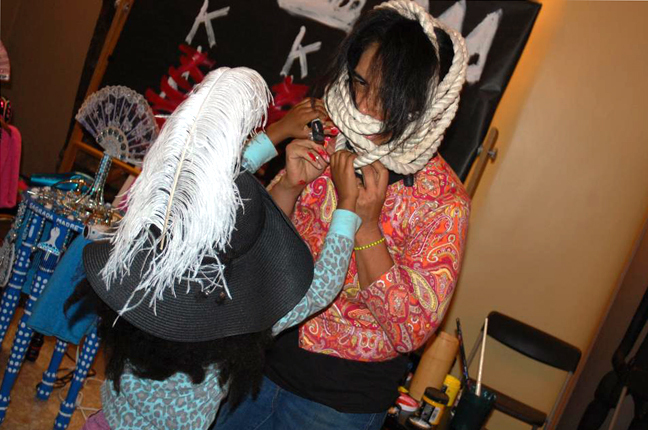 In memory of the enslaved ancestors, participants are invited to labor first, before playing the game. The group (each participant with a brush in hand) paints the gate white, with fast-drying paint. Meanwhile, I begin the interactive lesson on the Orishas as they pertain to Criolization. The performance becomes dialogical. While the paint dries, we move to the art workshop tables, where I invite participants to create their own miniature Orisha Four Square artwork, with provided canvas boards, paint and mixed media. I continue the lesson as the participants create. Once the gate has dried, participants are invited to play Four Square. Two groups play simultaneously on either side of the gate. When a player wins, she or he can cross through the gate in any performative manner desired, and place herself or himself in the line to commence playing the game on the other side. Through the use of poetic playfulness, the performance game raises the following questions: “Who are the gate keepers in your life? What are the obstacles you face? Where are you trying to get to? What do the two sides represent to you? On which playing field will you engage? Will you labor before you play? Will you play on both sides, or just one? On what side will you start? Where would you like to end up? Will you go through the gate, back and forth, or in just one direction? How will you get to the other side? Will you open the gate and walk through? Will you run around it or jump over it? Will you move the gate aside? Will you roll the ball through it first and chase it? Or do you prefer to remain on one side? Will you act as a gate keeper or gate opener, as others attempt to cross over to the other side? 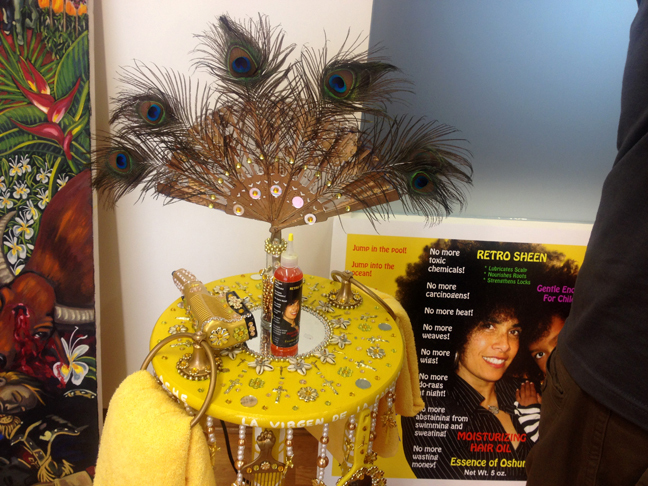 For more information on Orishas Through the Crossroads and the Gate, click here. 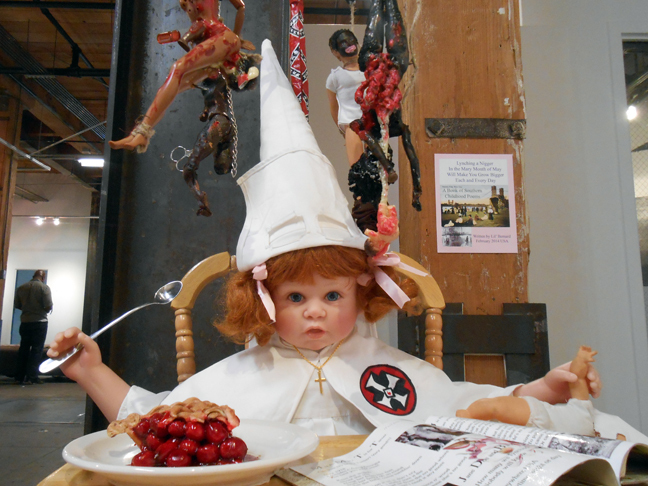 Ain’t Funny is a ritualistic performance art piece, involving spoken word, public engagement and sculpture. It addresses memory, healing and power. Through a thematic use of religious syncretism, resulting from Criolization, this work is a symbolic destruction of the desecrating stereotypes of Black people which arose from colonialism. 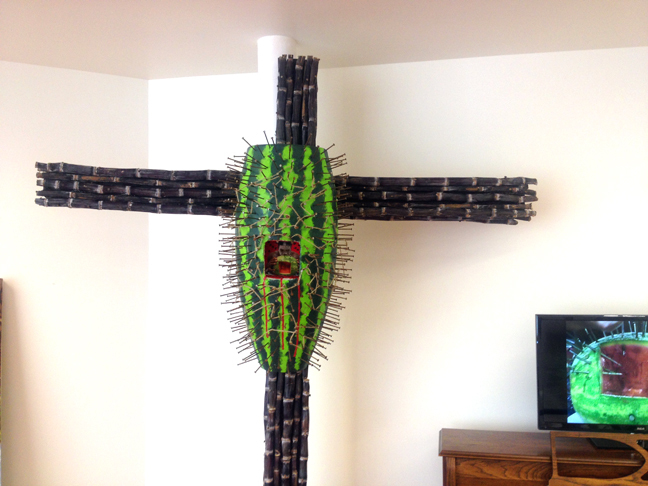 Content: The sculpture used in Ain’t Funny is a crucified watermelon nail fetish on a cross made of sugar cane. The precise materials of the sculpture are purple sugar cane stalks, wood, acrylic paint, rope, chain, hammer and rusted nails. 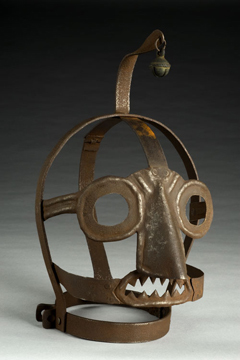 Inspiration: The inspiration for Ain’t Funny came to me from an image of a Nkisi (Congolese nail fettish sculpture) which caught my eye in a book that my independent study professor, Ulysses Jenkins, lent to me in October 2013. I pointed out my fascination with the image to Ulysses, telling him that I felt a strong sensation of the object inspiring me towards some creative expression regarding it, but that I could not quite yet decipher the message which I was receiving. Ulysses understood what I was saying. 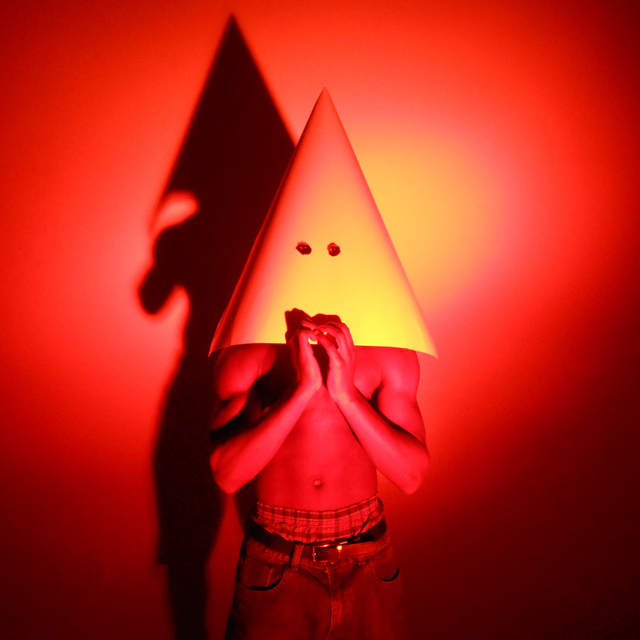 He is an avant garde performance and video artist whose work is spiritually and Afro-futuristically based. He is the only Black professor I’ve ever had . Images of the Nkisi thereafter kept pervading my thoughts and dreams. A few weeks later, Ulysses took me to see his friend Amalia Mesa-Baines’ New World Wunderkammer exhibition at the Fowler Museum UCLA. By surprise, we serendipitously found that Amalia had included an actual Nkisi in her exhibit, and images of it in her photographic collages in the show. She also included several Afro-Caribbean and Latin American syncretistic religious artifacts which she had mined from the museum. I was amazed at the similar historical, cultural and spiritual context between Amalia’s work and mine, though our paths are different. 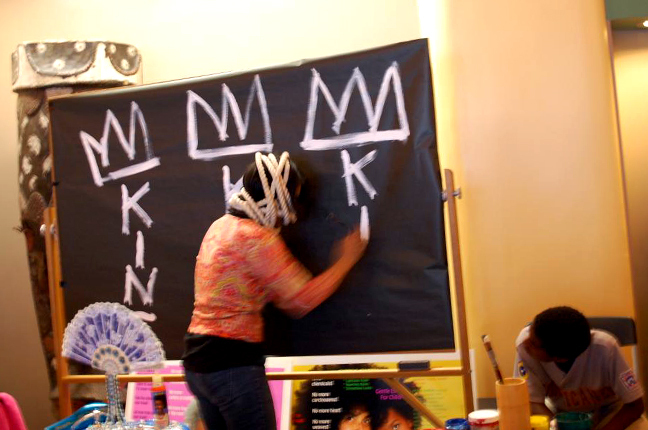 Amailia Mesa-Baines is Chicana, a MacArthur Genius, an artist, author, curator, psychologist and professor. Ulysses has since introduced me to Amalia with whom I have been in dialogue. 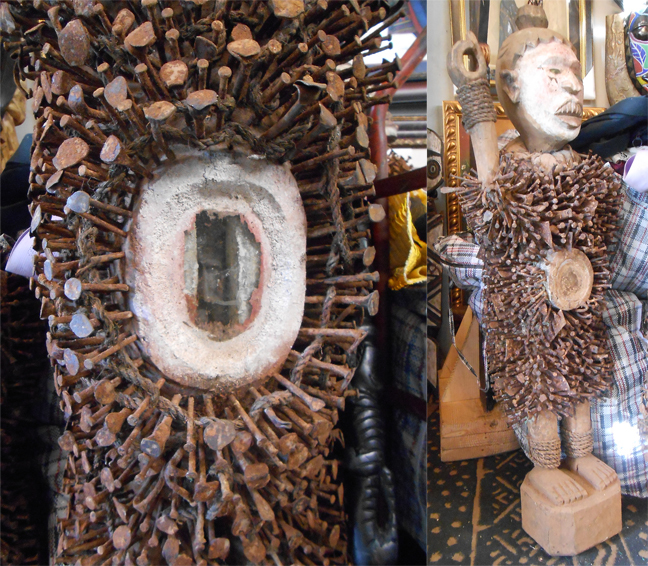 LEFT: Nkisi (Congolese Nail Fettish Sculpture). CENTER: An 1890 South Carolina engraving, depicting the denigrating stereotype of negroes’ elation over watermelons. 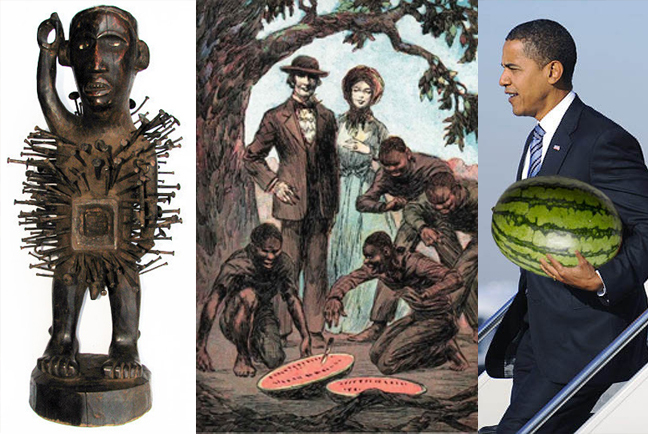 RIGHT: One of the many contemporary images online, stereotyping Black people, relative to the consumption of watermelons, this one mocking our President Barack Obama. Inspired by what I perceived to be clear divine signs, I began researching the Nkisi. 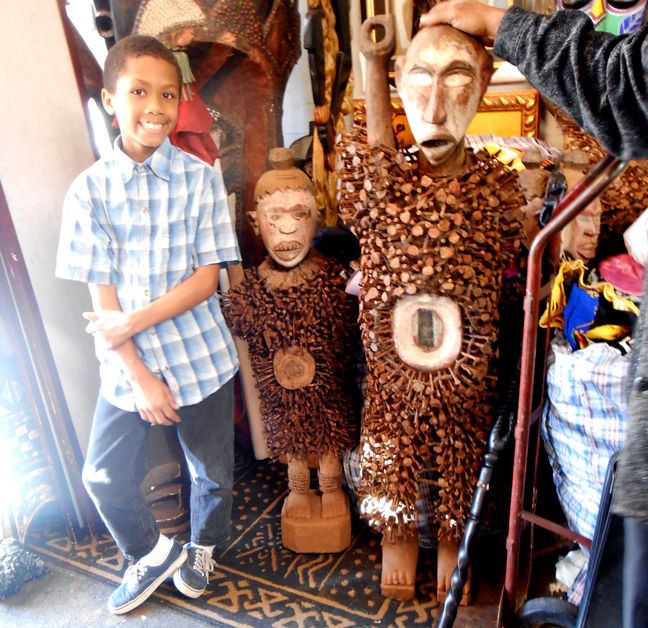 I found out that they are community-owned consecrated sculptural figures and vessels which have been used religiously, for centuries, in the Congo for protection and empowerment. They are believed to be sanctuaries for the souls of the ancestors and sustaining forces of life on earth. In strict accordance with specific songs, nails are hammered into the Nkisi to excite medicinal ingredients which are housed within cavities that are hidden in the figures. 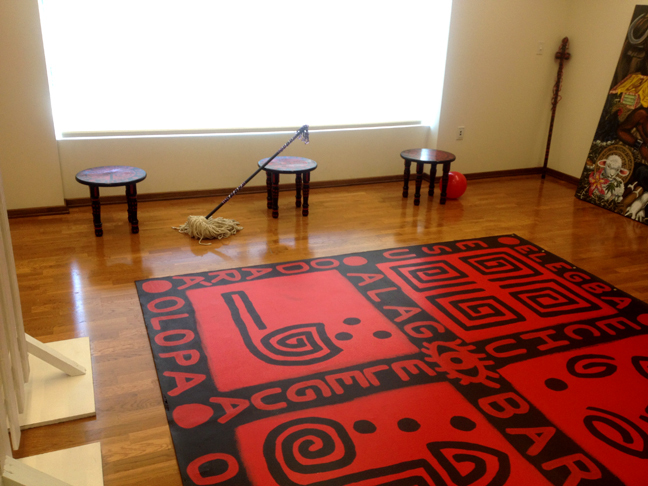 This action is believed to elicit healing energies that maintain social health and wellness within a community. The religion in Cuba, of those descended from Congolese slaves, is known as “Palo,” which means “Stick” in Spanish. 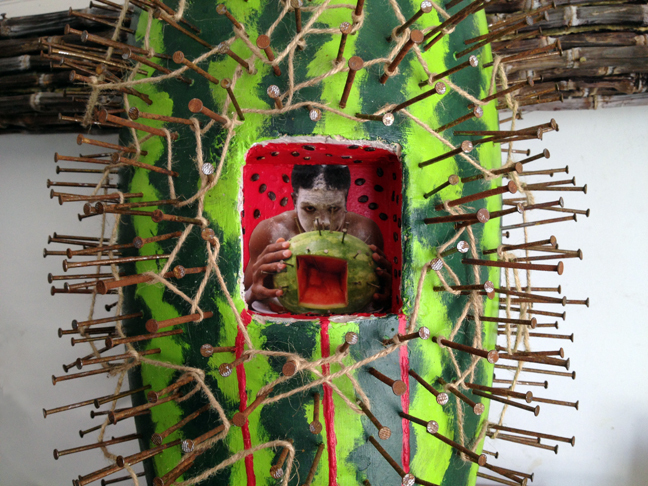 The spiritual significance of the watermelon in my sculpture stems from the Yoruba religion known as Ifá. In order to avoid persecution in the New World, the enslaved Yoruba people hid their Orishas (deity) behind the names of Catholic Saints with similar characteristic. A new religion known as Santeria was birthed in Cuba, my birth place, where Orishas are considered to be one with the Catholic Saints. Foods are placed at the alters of these spirits as offerings and for veneration. 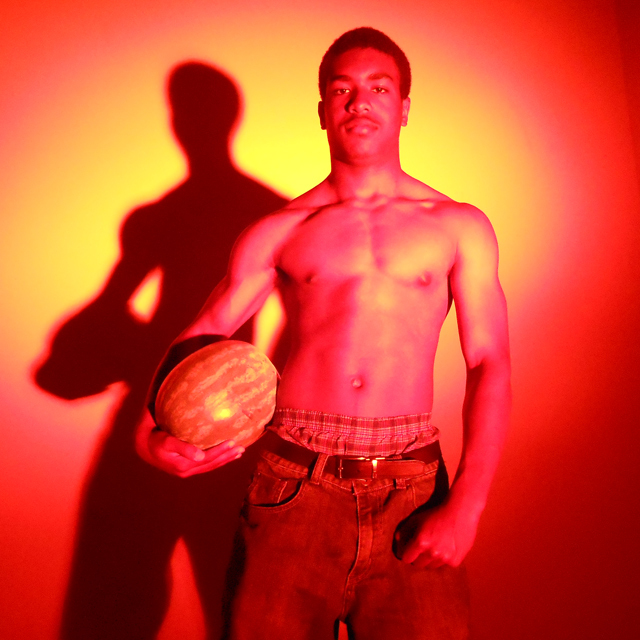 Watermelons are offered to the female Orisha Yemayá who is is believed to have accompanied the enslaved across the middle passage. She is syncretized with La Virgen de Regla, the patron saint of Havana, and is the Orisha of the ocean and of motherhood. 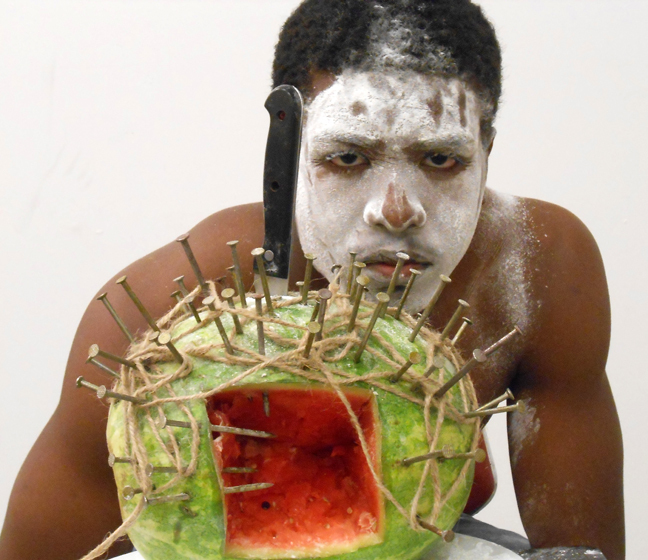 Watermelons are also offered to the male warrior Orisha Ogun who rules with iron (the stuff nails are made of) and a machete. He is syncretized with St. Peter, the apostle known as the Rock of Christ. I reference these Orisha-Saints in my spoken word-performance art in this work. The reference of the sugar cane stems from the following: I grew up as a toddler in Santiago de Cuba (my birth city) and an immigrant child in Brooklyn, New York, chewing and sucking on sugar cane, which is customary among Cubans and Jamaicans. My parents, who are also Cuban-born and both half Jamaican, taught me that enslaved Africans who toiled all day in the Caribbean sun chopping down sugar cane, quenched their thirst and energized themselves by chewing the fibers and sucking out the juice of the cane, known in Cuba as “guarapo.” I imagine the simple pleasure my enslaved ancestors may have experienced, amidst the tall straight stalks of the sugar cane field, when they gazed upon the green stripes of a round watermelon presented to them. I envision them with beads of sweat on their brows and lashes on their backs, hacking open the watermelons with their machetes, to reveal the blood-red fruit on the inside, speckled with black seeds. I image them digging their parched mouths into the watery flesh of the sweet fruit, as if it were a holy experience, like diving into a medicinal, life-sustaining oasis from which their thirst would be quenched, their abused bodies hydrated and nourished long enough to make it through the long hours of forced labor under the stifling, burning tropical sun. And yet, from these poignant life-sustaining moments in slavery, surrounding the consumption of watermelon, a mockery was made that has endured centuries. I view it as sacrilege and it saddens me. Concept: Donning and Dismissal of the Conqueror’s Coiffure is an installation and ensemble performance art piece which explores the psyche and self-perception of the colonized Black woman. It raises awareness of the pervasive subconscious association of blackness with wrongness, as evidenced in commonplace expressions such as “good hair” versus “bad hair.” The examination of these learned subconscious feelings of inadequacy, reflected in hairstyle, speaks to a larger audience. It creates conversation about the collective unconscious dependency born out of colonialism. The installation of Donning and Dismissal of the Conqueror’s Coiffure is composed of three Afro-Cuban folkloric hair salons that are ornately codified – one for each of the three water Orishas (Yoruba deities): Oshun who is syncretized with La Virgen de La Caridad del Cobre, Cuba’s patron saint who is from Santiago de Cuba where I was born (performed by me), Yemayá who is syncretized with La Virgen de Regla (performed by Autumn Nailes) and Nana Baruku who counsels women who have been raped and is the grandmother of all humanity (performed by Lena Cole Dennis). The hair of the three women performers is not chemically processed, but has been straightened by heat prior to the performance. Opera singer Reina Marielena Powell (my cousin) was scheduled to sing live, Schubert’s Ave Maria, but she was called in for an audition and hence did not perform. Instead we used a recording of opera singer Jessie Norman, singing Ave Maria. 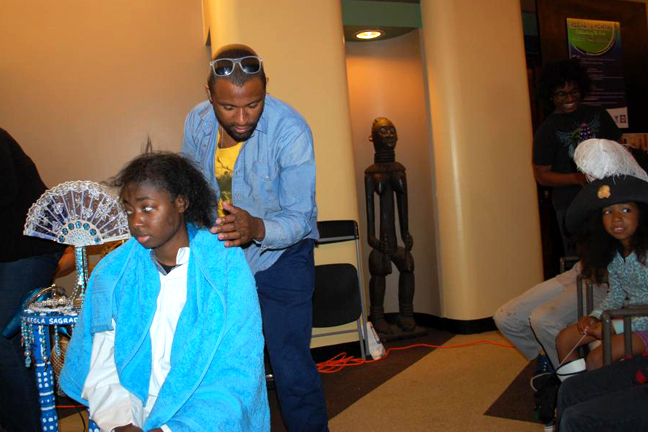 The song played while volunteer members from the audience combed the straightened hair of the subjects. 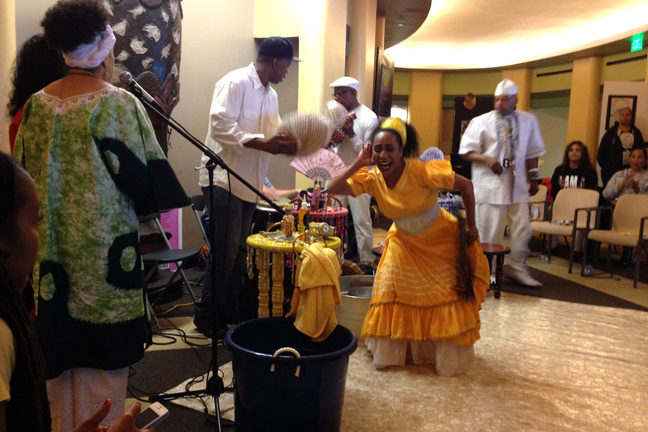 A lively discursive happening occured where the Santero (Ifa Priest), Baba Craig Ramos song Orisha songs in call and response to the three water Orishas presented while Kati Hernandez (Afro-Cuban Orisha Dancer) perform doing her own vocalizations characteristic of the Orisha she was dancing. There was discussion between the subjects and the volunteers and those “on stage” with the audience. Other Women with straightened hair, and with the same T-shirt also hidden underneath their street clothes, are planted in the audience. They volunteer to have their hair ceremoniously doused and dried. 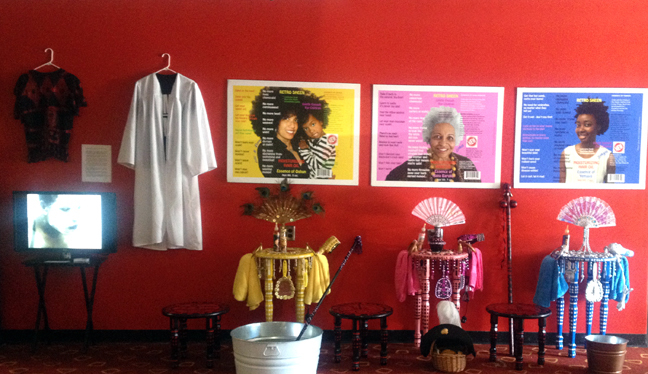 At the end, the Three Women who played the water Orishas take off their white robes. The women from the audience who were planted and “volunteered” take off their top layer shirt. 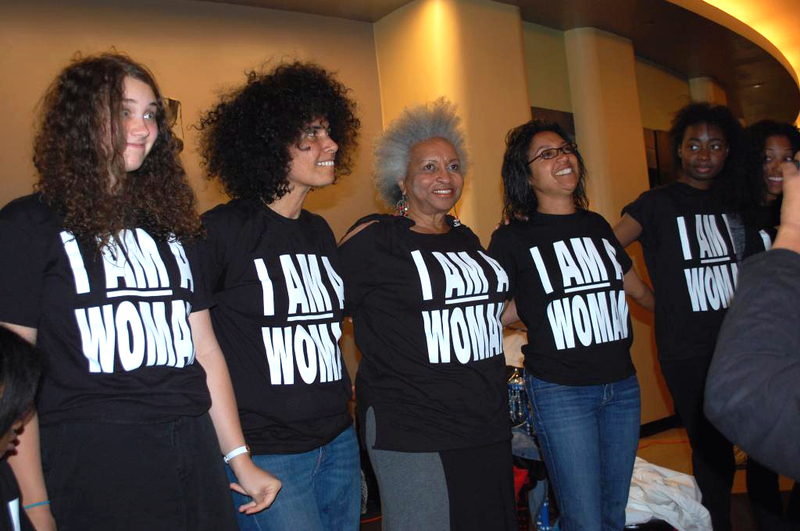 Resulting is a line of women, with naturally puffy hair, all wearing black T-shirts that say, “IAM A WOMAN” in white letters. 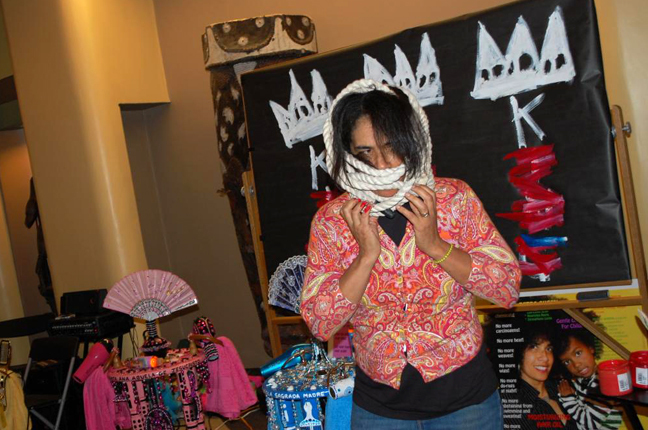 I performed the piece as a solo experimental work (as Oshun) at Torrance Art Museum’s Mas Attackexhibit on October 12, 2013 and at Avenue 50 Studio in Los Angeles, in June 2013, for the Seven Beauties exhibition, curated by artist José Lozano and featuring the works of seven female Los Angeles-based artists: Kim Abeles, Leigh Salgado, Rochelle Botello, Poli Marichal, Stephanie Mercado, Linda Arreola and Lili Bernard. 4:15 – MicroAggressions of Racism in Academia, a BAILA (Black Allies in Los Angeles) Roundtable Discussion with Panelists Holly Tempo, Derrick Maddox, Chelle Barbour, Lili Bernard, Yrneh Gabon Brown, Dr. Carole Jordan-Harris, Dr. Roberto Vargas, Ronald Robertson and Brittany Gibson. Moderated by Zeal Harris. Attending Physician in Department of Obstetrics & Gynecology in private practice at at Cedars-Sinai Medical Center, Mentor and former Chairman of the Board of Trustees at Charles R. Drew University of Medicine and Science. Associate Professor in the Division of General Internal Medicine and Health Services Research at the Geffen School of Medicine at UCLA, Associate Professor Medical Sciences Institute, Charles Drew University, and Associate Natural Scientist at the RAND Corporation. ROGER GUENVEUR SMITH will kick off the event at 3:00 pm with a live performance of an excerpt of his play, Rodney King. Roger is an actor, writer, and director whose work has illuminated the international stage and screen. He adapted his Obie Award-winning solo performance of A HUEY P. NEWTON STORY into a Peabody Award-winning telefilm. His most recent play, RODNEY KING, has already been lauded by the Los Angeles Times and the LA Weekly as among the season’s best, and is currently featured in the Under the Radar Festival at the Public Theater, where he has frequently presented his history-infused work. For Spike Lee’s classic DO THE RIGHT THING, Mr. Smith created the stuttering hero Smiley, as well as a gallery of memorable characters in Mr. Lee’s MALCOLM X, GET ON THE BUS, and HE GOT GAME. His eclectic range of screen credits also includes EVE’S BAYOU, DEEP COVER, HAMLET, ALL ABOUT THE BENJAMINS, and the HBO series K STREET and OZ. He was nominated for the Screen Actors’ Guild Award for his work in AMERICAN GANGSTER and recently starred in the acclaimed indie films MOOZ-LUM and BETTER MUS’ COME, as the Prime Minister of Jamaica. Among his upcoming releases are two dark Los Angeles dramas: WATER AND POWER and DIRTY. FREDERICK DOUGLASS NOW is Smith’s signature solo, played on countless stages from the Kennedy Center to London’s ICA. INSIDE THE CREOLE MAFIA, a “not-too-dark comedy” is his award-winning duet with Mark Broyard. He has also written and performed JUAN AND JOHN, inspired by baseball greats Juan Marichal and John Roseboro, IN HONOR OF JEAN-MICHEL BASQUIAT, THE WATTS TOWERS PROJECT, and WHO KILLED BOB MARLEY?, which inaugurated Harlem’s Gatehouse Stage. CHRISTOPHER COLUMBUS 1992 was the first of many collaborations with composer Marc Anthony Thompson. Their commissions also include the volcanic love story, ICELAND; TWO FIRES, inspired by Philadelphia’s Yellow Fever Epidemic of 1793 and the MOVE bombing of 1985; and TWENTY TWENTY, a multimedia survey of black music in Los Angeles, 1960-80, for the NOW DIG THIS! 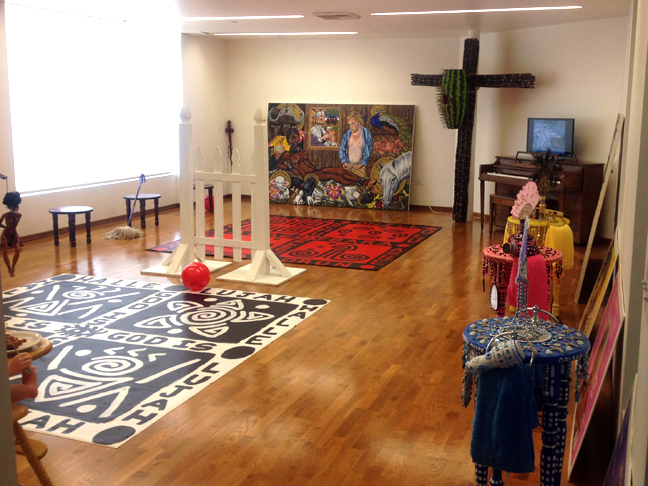 retrospective at the Hammer Museum, curated by Dr. Kellie Jones. FIVE HUNDRED LIVES PER MILE is the working title of Smith and Thompson’s exploration of the Panama Canal and the human costs of its construction, commissioned by San Diego’s Old Globe Theater. Smith directed the Bessie and Ovation Award-winning RADIO MAMBO: CULTURE CLASH INVADES MIAMI and, more recently, the acclaimed West Coast Premiere of Katori Hall’s THE MOUNTAINTOP and Steven Berkoff’s AGAMEMNON. Roger studied at Yale University and Occidental College, and has taught at both institutions; as well as Cal Arts, where he currently directs his Performing History Workshop. TONYA INGRAM will perform in the Spoken Word, her poem, Unsolicited Advice (after Jeanann Verlee), Tonya is the 2011 New York Knicks Poetry Slam champion, a member and co-founder of NYU’s poetry slam team, a member of the 2011 Urban Word–NYC team and the 2013 Nuyorican Grand Slam team. She is the author of Growl and Snare. Her work has traveled to Ghana, California, Michigan, Massachusetts, Washington D.C., New York, The Literary Bohemian, and Youtube. She is a New York University alumna, a Cincinnati native, a Bronx-bred introvert, and a hopeful Los Angeles flower-child, where she is pursuing her MFA in Public Practice at Otis College of Art & Design. LENA COLE DENNIS’ community activism began by learning the rules and figuring out how to break them without getting into trouble. She was able to support, protect and enhance the lives of the underdog working for Rockwell International as a Community Interface Program Manager (CIP). Cole Dennis developed community programs, identified non-profit organizations, developed educational projects and created self-sustaining partnerships and community collaborations. As External Affairs and Corporate Liaison for the Space Shuttle Program, she planned NASA and US Air Force Corporate Exhibits/ Events and Expos for Government Relations and Congressional Partnerships. Her team created over 20 Space Shuttle Launch Events at NASA Kennedy Space Center including the highlight visit by President Ronald Reagan, community members, congressional members and staff. She worked with the White House Advance staff creating the homecoming of the Space Shuttle Landing of the first black and the first woman astronaut for over 1000 people at Edwards Air Force Base. As Director of Outreach and Community Education at Jenesse Center Inc. Domestic Violence Program. Lema collaborated with SPA-6, Brotherhood Crusade, Status of Women, Urban League, NAACP Legal Defense Fund, Great Beginnings for Black Babies, His Sheltering Arms, Urban Issues Breakfast Forum, Economic Development Union for Compton, Los Angels Refugee Evacuation and Resettlement Program, Reach Out and Touch King/Drew Health Foundation of Los Angeles, Arc Mid-Cities, Los Angeles Women’s Program, Parents Advisory Program, Head Start, Watts Summer Festival and so many other organizations. A former performing member of the 1970′s Watts Writers Workshop, Lena is a poet and will be performing her poems, O Say Can You See, Changes and Don’t Blame the Children. She is the mother of two independent thinking adults Kamili Johari Dennis and Gantri Harlen Dennis. She has an incredible grandson Josiah Harlen Dennis who is attending Palomar College. DOMINIQUE LABAT will perform for a praise dance for us. Dominique is currently a Studio Art major at Golden West College in Huntington Beach. Born and raised in Long Beach, she has been surrounded by art throughout her life. She graduated from Robert A. Millikan High School in Long Beach participating in the Art Department. Currently a 19-year-old, she enjoys illustrating and has had her work recognized by pop-culture figures like Rihanna and Ariana Grande. Dominique is also a 3-year gold metal winner for the NAACP ACTSO program under drawing and painting. Her second passion is expressive dance. She is a liturgical dancer at St. Brigid Catholic Church in Los Angeles and has been since she was 9 years old. YRNEH GABON BROWN was born in Kingston, Jamaica. Now living in Los Angeles, CA. With more than twenty years experience under his belt, Yrneh is credited as an Actor/Singer, Creative director/Producer, Image specialist, Make-up/SFX Artist and writer. Yrneh is a graduate from the University of Southern California, (USC) Gayle Roski School of Fine Arts, in los Angeles, California. Multi-talented, self-motivated, passionate and determined in front or behind the scenes, his goal is to get the work done. 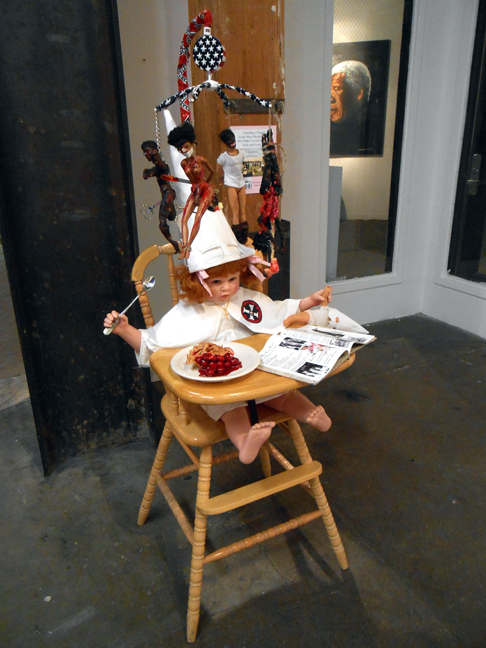 Yrneh’s current project, Endangered White (Visibly invisible)will be featured in solo exhibit at the California African America Museum in the Summer of 2014. 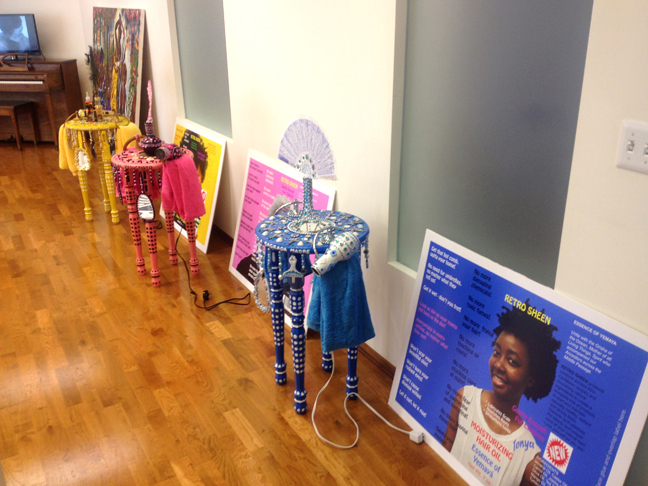 The work brings attention to Black people living with albinism, giving a voice to the voiceless, and is educational. LILI BERNARD is a Cuban-born, Los Angeles-based visual artist and actor. 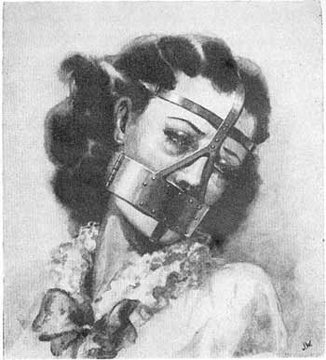 She has exhibited her artwork in numerous galleries and institutions. Through an array of mediums, her artwork explores her Afro-Indigenous Caribbean ancestry in a quest to examine issues of racism and feminism, past and present. As an actress Lili, has performed extensively in theatre and TV, and has been a member of SAG/AFTRA since 1987. An arts activist, independent curator, and blogger for the Huffington Post, Lili is the founder and organizer of the movement, BAILA (Black Artists in Los Angeles). She is currently a 2014 MFA candidate graduate student at Otis College of Art and Design, in the Public Practice Program, under the tutelage of Suzanne Lacy. Lili is married to civil rights attorney, Franklin L. Ferguson, Jr., and gave birth to six children in a ten year span: Rafael, Isaiah, Elias, Uriel, Joshua and Zion. KATI HERNANDEZ will be performing for us Afro-Cuban folkloric dance and rumba. Kati was born and raised in Cuba. A graduate of the Instituto Superior de los Artes in Havana, Katie has extensive international experience performing Afro-Cuban folkloric and contemporary dance at major venues. A choreographer and instructor, as well as a professional dancer, Kati has performed with A-List Cuban artists such as Bobby Carcases, Chucho Valdez, Fransisco Aguabella, Lazaro Galarraga and Manuel Mendive. Currently, Kati is the artistic director and choreographer of her own community-based, Afro-Cuban dance and music project, “Dancing From the Heart.” She lives in Santa Monica, California, and teaches dance throughout the Los Angeles area, in studio group settings, in workshops, privately and in several Southern California colleges and universities, including the University of California, Irvine. ED TURNER will be playing African drums. Ed is a native of Gary Indiana and has lived in LA well over twenty years. He has become one of the most called on percussionists and singers in the genres of Yoruba-Lukumi, Bakongo (Palo) and Afro-Cuban Secular music in Southern California. 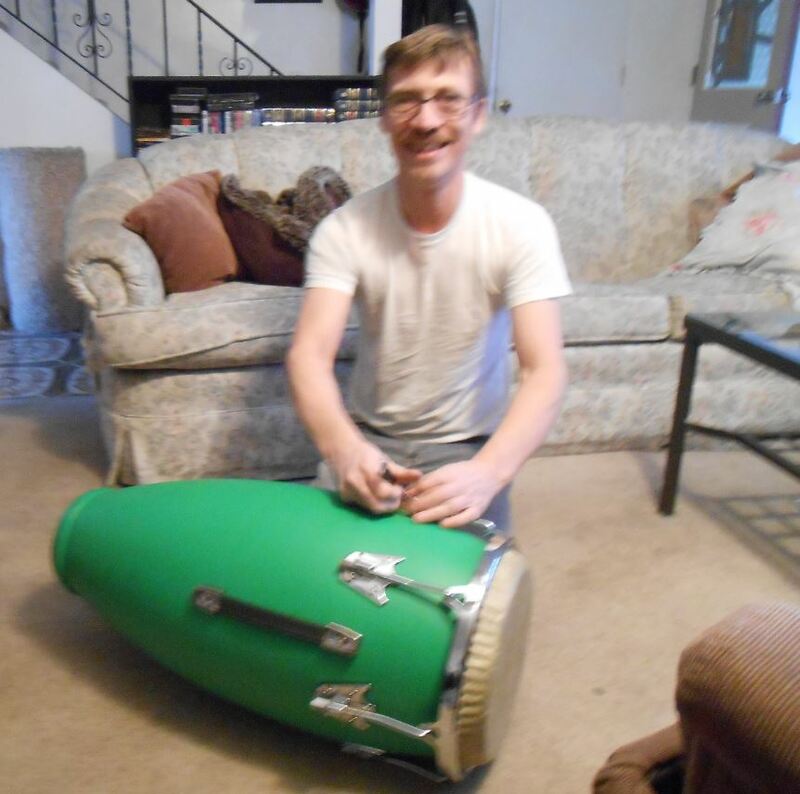 Ed is an accomplished percussionist and plays Bata Drums, Congas, Shekere, Agogo (Bell) and Clave (pronounced CLA-VAY). Ed is one of the original, founding members of “Odo Olo Ilu Ire” and describes himself as “A Lover and a Player of this Music”. BOBBY WILMORE will be playing African drums. Bobby came to Los Angeles in 2001 on a music scholarship to USC Thornton School of Music. Since then he’s focused his studies on Afro-Cuban music with his Godfather Lázaro Galarraga. They have recorded several albums and instructional DVDs. The two of them play regularly with their band SitaraSon, as well as playing in Ceremony in the Yoruba-Lukumi and Bakongo (Palo) Traditions, and in performance with Dancer/Choreographer Kati Hernandez. The three of them have produced many workshops and shows w artists such as Miguel Bernal, Cusito Peñalver and Muñequitos de Matanzas. Bobby plays percussion for many styles of music and is initiated as an Omo Anyan (authorized to play Sacred Drums). Bobby is also a member of the Folkloric Group Odo Olo Ilu Ire and he has had the honor of performing/recording all over the world with artists such as Harry Belafonte, Francisco Aguabella, Maya Angelou, Ron Trent, Kathleen Grace, Sandy Perez, and Mike Spiro. Bobby is the Musical Director for L.A.’s top Pan-African performance ensemble L’Esprit D’Afrique. This group combines dancers and musicians who perform a variety of African influenced traditional and contemporary styles. They released their first album in 2013. Bobby also spreads his love for music by teaching people of all ages. He recently produced an album of kids music titled “It’s a Beautiful Day to Play” in hopes of inspiring the next generation of drummers to come. SUPPORTING PERFORMERS: Aarin Ables, Amber Mize, Candace & Klarke Hobson, Karen Moss, Kathleen Glynn, Lisa Diane Wedgeworth, Nicola Goode, Zeal Harris and the Bernard Ferguson Children (Rafael, Isaiah, Elias, Uriel, Joshua and Zion). Q: How would I describe it? 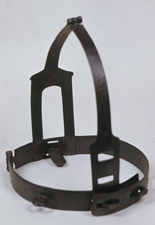 A: The continuation of a medieval practice: the implementation of the scold’s bridle or brank.